Is Your Wood Fence Safe From Termite Damage? If you don’t keep an eye out for termite damage, your wood fence could be destroyed. Wood fences are great for durability and aesthetic appeal. They are a common residential choice for people that are looking for cost effective privacy and function. Unfortunately, they are not always invincible and safe from pests – termites, in particular. Spring is on the way and with the warm weather comes swarms of destructive termites in Maryland. Mid-Atlantic Deck and Fence is here with some information about termites and your wood fence. Termites are tiny, pale, and soft-bodied insects that travel in colonies and feed on dead plants and wood. Even though they are small, the impact of their collective bite can cause serious damage to timber and wood (both living trees and dead) as well as the construction of homes and fences. The worst part? Their presence often goes unnoticed until the damage is considerable. The biggest sign that you may have a termite infestation is the holes they leave behind. As they gnaw their way through wood, they leave holes that can cause splits in your wood. If you see holes, but no termites, look at the pattern of the holes. Subterranean termites prey on soft wood and leave behind a honeycomb pattern. Drywood termites tend to chew larger sections resulting in tunnels of damage. You should make a habit of assessing your wood fence for termite damage throughout the spring season. If you see damage, you have to contact a professional to treat and remove the termites before the damage is irreversible. It is good practice to remove sources of moisture, since termites dwell in damp areas. Additionally, remove any nearby sources of wood (mulched area, tree stump) away from your fence. 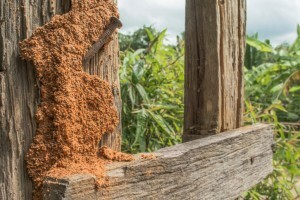 If termites begin to prey on other nearby wood, there is a good chance they will migrate to your fence next.